One of my gardening friends invited me to be a sharecropper, so a couple of Saturdays ago I helped with planting. 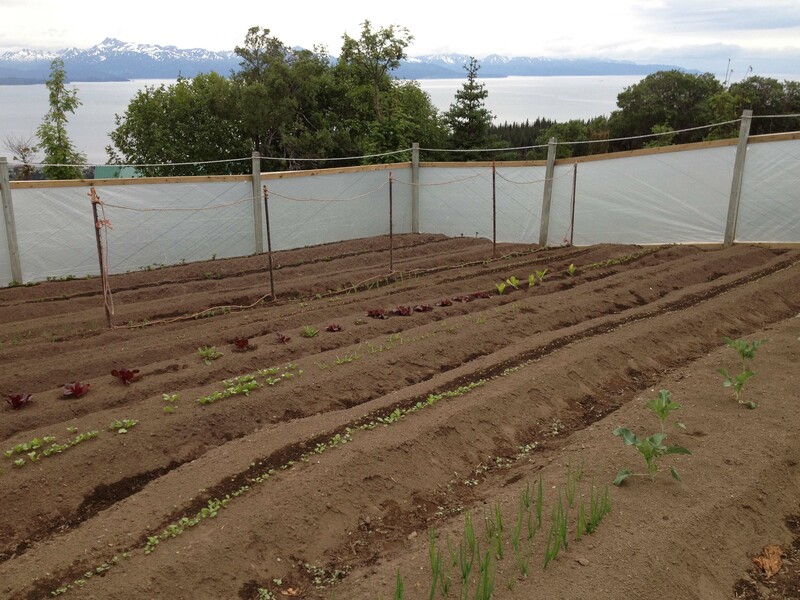 Inside an elegant moose-proof enclosure, I knelt between precisely mounded rows to plant radishes, turnips, lettuces, kale, garlic, and more–more than I can remember but don’t have to because the gardener’s head contains a complete catalog and farmer’s almanac. How I’ll earn a share of the crops remains to be seen. A kindergarten child could have contributed as much as I did the first day, because the gardener had prepared the soil weeks before and had the planting well underway. When Homer had sundress weather the following week, I offered to water, but the polymathic gardener had already installed an underground irrigation system set on timers. Yesterday I noticed that some of the rows I planted veer out of line, and in several places there’s sprouting evidence of seed spills (it takes practice to tap just one minuscule seed at a time from the packet). I’m hoping this won’t be so noticeable as the garden matures. I hope the sandhill cranes will continue their pas de duex in the meadow. I’m in my apartment in Homer, AK. I’m sleeping—I mean, I was sleeping—on the left side of the bed. The bedroom door is straight ahead, not left. The kitchen is not downstairs. That’s where the Coast Guard boy lives, the one who’s a cook on The Hickory; when his ship’s in port, the one who in late afternoon makes his own dinner that smells so good I want the recipe. My electric kettle, Jugtown pottery cup, coffee and filters are to the right, not left, of the kitchen sink; refrigerator left, not right. After a couple of weeks at my sister’s house in Georgia – this being the second time I’ve traveled west to east instead of the opposite—I am re-oriented to my place in Alaska, and I don’t have to figure out where the heck I am when a dream about being lost in a big city wakes me in the night. Really, all I need to do is go to the bathroom–that’s out the bedroom door—straight ahead, not left, which would put me in the closet—then get back to bed and into sleep. Breathe, I tell myself. I’m not lost. I’m home. I breathe and think. I’m not wandering around in running shorts between trendy restaurants and druggy residential neighborhoods in downtown Richmond. I’m not running down an interstate access road between Charlottesville and Staunton, and I’m not running into a gentile Episcopal church along the way to ask for help from the altar guild ladies who are arranging peonies in brass vases for Sunday service. My cell phone works. My credit cards haven’t been stolen. My children are OK; there’s no tornado roaring toward us. I’m home, in Homer, in my own bed. My dreams are always busy and crowded with people. My children and sisters are often in that place where my mind goes when I’m asleep. Sometimes my mother is there; sometimes my father. Sometimes there’s a guy who loves me better than anything in the world. I love those dreams. He re-programs my cell phone. He drives that long Volvo station wagon I once had from the edge of the lake where, brakes failed, it’s rolled backwards down a steep hill. My two husbands show up occasionally in my dreams—tactfully without their wives and never any of them at the same time. I’m glad to see my husbands. I loved them. I’ve loved a few others, and sometimes one of them is in the place my mind goes when I’m asleep. They help me, and I help them. I’ve driven them to the hospital and hugged them to let them know everything’s going to be OK. Sometimes we go dancing, and what a good groove we have going. 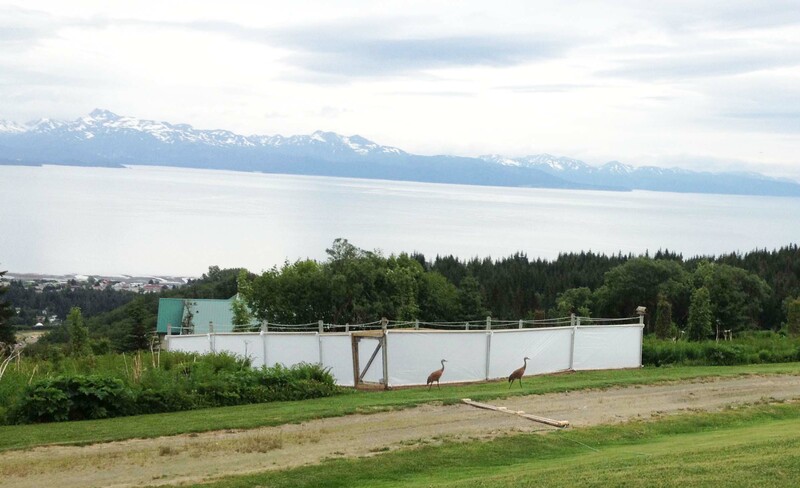 But now, I’m in my apartment in Homer, Alaska. I’m on the left side of the bed. The bedroom door is straight ahead. I’m home. For a whole year, I’m home, and that is not a plastic container cap up there at the top of this post. 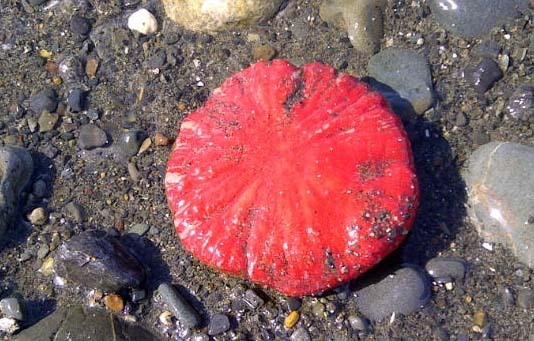 It’s a sea creature, a living thing, like me, that I encountered this morning when I went for a walk on the beach.